Our dresses are available in sizes 00-30W. Most are available with extra length, unless otherwise noted in the description. Extra length is strongly suggested for anyone 5'7' or taller, particularly for full length styles. To find your size, please view our size charts and watch our How-To Take Your Measurements video for step-by-step visual instructions. It is customary for most people to need minor alterations to get a perfect fit. If you are unsure about which size to order, please contact us. Swatches for all current fabrics are available directly to you through our Online Swatch Store. Special Order: Special Order dresses generally ship 8-9 weeks from the time you place your order. Rush Delivery: Rush delivery is available on most special order styles, unless otherwise noted in the description. Rush orders ship approximately 7-8 weeks from the time you place your order. Please contact us to learn more about our Rush Services. 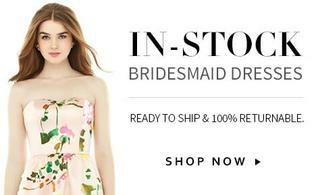 Or browse our In-Stock bridesmaid dresses, which ship in 1-3 business days. Important Note: We STRONGLY suggest that you order your dress so that you receive it at least 2 weeks prior to your event date. You are more than welcome to inquire about the possibility of placing a rush order by contacting us. Special order dresses are cut to order. Meaning, they are not put into work until you place your order. Special order dresses are delivered approximately 8-9 weeks from the confirmed order date, and all sales are final. In-stock/Returnable dresses are stocked for immediate delivery. In-stock dresses ship immediately. In-stock dresses are 100% returnable. View our Full Return Policy. Coupon codes cannot be applied to previous purchases and cannot be redeemed for cash or combined with any other offers. Limit one coupon per order.